We are the kings of plumbing in Amsterdam. Every day we show the living proof. Do you have a clogged drain, a leaky faucet or broken heater that has to be fixed soon? You better don’t get into more trouble by trying to fix it yourself. 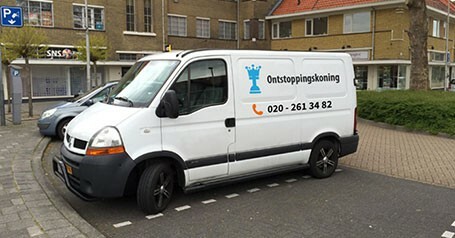 The Ontstoppingskoning has a network of plumbers and cloggers to its disposal in Amsterdam and North Holland. Those partners are well qualified and speak English fluently. Let a professional do the job. Our plumber partners install or repair pipes every day. Any problem in your bathroom, restroom or kitchen will be solved by our excellent plumber. We fix all your plumbing issues without charging you our costs of transportation! How about that? You can call us any day of the week at any hour. We understand the emergency of leaks and other inconveniences that paralyze your house holding. We want to bring your comfort immediately back in to your life. Our plumber is a qualified expert who has experience with all kinds of houses and apartments in Amsterdam. Let us unclog your toilet and fix your leaking pipes. Flooding and a terrible odor can be the result of a clogged toilet. Another irritating situation is a drain that gets clogged or won’t flush anymore. To locate blockages we might use our modern camera equipment. That way we can locate the exact problem, without damaging your floors and walls unnecessary. Some problems need to be fixed by a plumber who has the specific machines and equipment to do the job right. Besides, for your own safety it’s better to get a professional. We are certified by Dutch law and legislation. We keep the costs low for you and our invoices are specified. Before we get to work, we’ll tell you exactly what we’re going to do and what it will cost you. Our plumber is friendly and speaks very well English. Don’t let these kitchen or bathroom problems ruin your day! We are on our way!